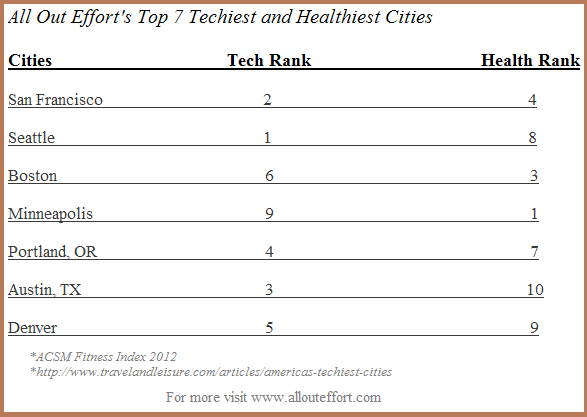 All Out Effort Blog: Smartest Cities Also The Healthiest? Smartest Cities Also The Healthiest? Are the most high-tech geek oriented cities also the healthiest? It's a hypothesis I wanted to find out. So I looked at the techiest cities in comparison to the healthiest cities. - On a side note, these are some of the most Paleo cities as well. What about the bigger cities or cities that care more about how they look? Was ranked 16th in tech and 22nd in health. It's still cutting edge in comparison to other big cities, and is always known for the amount of walking done there but still not good enough to be in the top 10 as a composite. Was ranked 13th in tech and 28th in health. Was ranked 17th in tech and 38th in health. Many people especially incorrectly assume because how one looks is so important in LA it would of course be one of the healthiest cities. But vanity only goes so far and we are notorious for driving everywhere and often look for short cuts in health. A lot of the most beautiful may also be in LA temporarily visiting. Was not in the top 20 in tech and 31 as far as health. By the beaches are some of the most gorgeous people (including a lot of visitors). But much like LA vanity is not the best long term motivator. So what do the engineers know that we don't know? Well for one, vanity is a poor motivator. Education, research, and information tends to lead to better results, something tech geeks are known for. And if somehow your health can improve your work performance, that will lead to more $$$, which can be motivation enough. It's a combination of seeing health as something that gives them an actual return on their time, and the ability to separate common belief vs truth. Education and rational thinking is clearly linked to health and looking at average income of engineers, it's also directly linked to wealth. They are beginning to call it the knowledge class. Ultimately being healthy is complicated and most people look for simple solutions. People from technical backgrounds have a better understanding of complex systems and aren't overwhelmed and understand it's about the process. Many people get skeptical when answers are too complicated. There's a saying that people would rather believe something simple even if it's a lie. Most people are so lost with health, because there's too much information out there. Paralysis by analysis. And who better to analyze all that data? Your beautiful yoga teacher, the actress on TMZ, the gym meathead? Or the guy who analyzes data all day for a living? Not everyone can trust the data. Those who do, tend to do better.